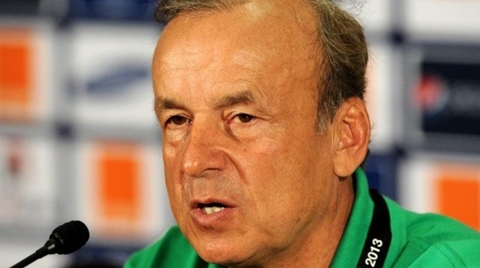 Nigeria's Super Eagles coach, Gernot Rohr, has spoken out on the growing speculations that there is a rift between him and midfielder, Onazi. While speaking as a guest on SuperSport’s Monday Night Football programme, Super Eagles manager, Gernot Rohr denied speculations that there is an ongoing rift between himself and Trabzonspor midfielder, Ogenyi Onazi. Onazi was a late withdrawal from the Nigeria squad for the Africa Cup of Nations qualifiers against Libya in October citing injury, only for the midfielder to feature for his Turkish club in their next league match at the end of the international break. He was also surprisingly omitted from the Super Eagles squad against South Africa despite being fit and the unavailability of the suspended Wilfred Ndidi and injured captain Obi Mikel. On the growing speculations that there is a rift between the coach and the player, Rohr stated: "After compiling my list of players for any particular match, l submit to the President of the Nigeria Football Federation and the Technical Committee. "I have to submit for them to approve. However there has never been any time where they have asked me to drop a player. That l would not accept. It is not true that l have issues with Ogenyi." Onazi started and went the distance in all the knockout games contested by the Super Eagles at the 2013 Africa Cup of Nations in South Africa.